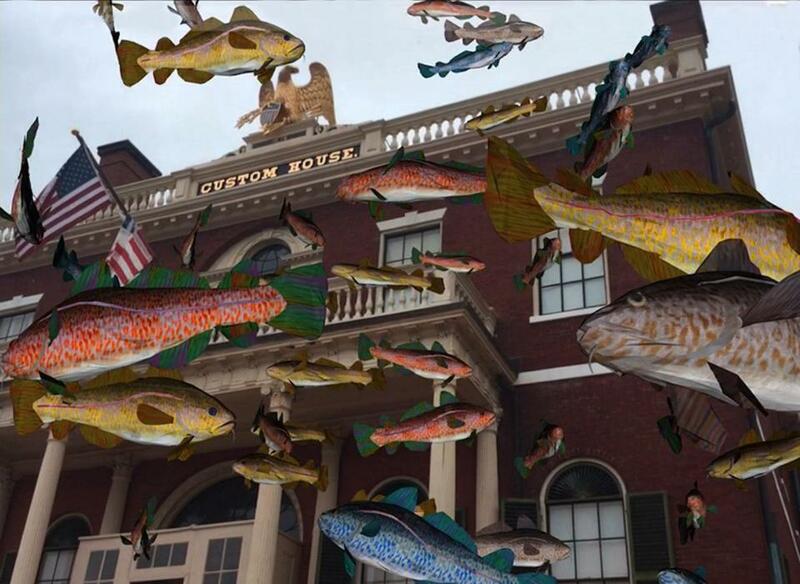 SALEM — Cod float into a golden sky outside the old Custom House. An elephant lounges nearby in a wing chair, and a Chinese woman peddles buns outside Derby Light. “The Augmented Landscape,” presented by Boston Cyberarts at the Salem Maritime National Historic Site, overlays digital art on the park’s buildings, green, and wharf. It works like Pokemon Go, with an app called Layar on your smart phone or tablet. Instead of chasing goofy characters, walk through virtual art installations. Augmented reality is a fantastical way to step into history — soon enough, it will likely be on educational programming menus at many historic sites. In these eight works, artists add a level of conceptual sophistication, metaphor, and humor that goes well beyond didactics. Take the flying fish in Will Pappenheimer’s “Ascension of Cod,” a wondrous depiction of one of historic Salem’s prime exports. We can leave it at that — glory be to cod! — or we can consider how the cod harvest has now shrunk due to rampant overfishing. Pappenheimer’s heavenly depiction might be the fish’s ultimate departure. Tamiko Thiel’s “Treasures of Seh-Rem” immerses us in trade — pieces of eight and imports and exports such as poppies and New England ginseng. Villainous faces loom above. These images, borrowed from early Japanese depictions of white men, inject greed into Thiel’s picture of abundance and indulgence. “Virtual China,” and “Virtual Russia,” John Craig Freeman’s images of Wuhan, in central China, and St. Petersburg are scattered over the grounds — you can walk right up to buildings and shops. Photographs digitally enhanced into three dimensions, they tatter like digital mirages, but provide as palpable a sense of place as Chinese porcelain, and evoke the port as portal to other worlds. “The Augmented Landscape” does more than mediate the experience of the park. It supercharges it. I tend to be a Luddite who prefers to perceive the world with the equipment I was born with, but I sure had fun.